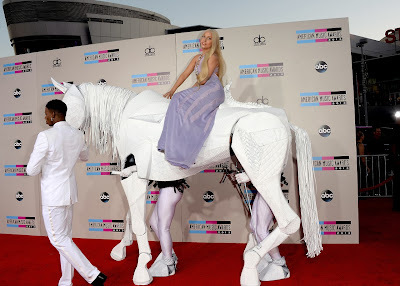 Lady Gaga showed up to the 2013 American Music Awards on a human-operated white horse, wearing Versace, a long straight blonde wig, and toned-down makeup. She almost looks like she's appeared out of a fairy tale, and was working her magic for the cameras. Gaga appeared calm, graceful, and out of this world on the red carpet. She has shocked many of her critics by looking glamourous and channeling Old Hollywood, when many negative commentators predicted "another meat dress." Perhaps after her performance with R. Kelly, and while her promo tour continues for ARTPOP, the backlash against the star will end. What do you think of the singer's red carpet outfit? Did you think the Glamour Princess Fairy Tale Look was a dream come true or a nightmare?